Microsoft Graph API is referenced here but that option is not available to me? Hi @arktex54, welcome to the forum! Thanks for providing that link to the docs say OneDrive v2 should be available as a “Storage type”. When I look at my 2.0.3.8 and 2.0.3.9 installations I see it listed as below. What version of Duplicati are you using? Thanks much for your reply. No updates are found when using “Check for updates now”. May I ask where you got these higher versions from? There are a few ways of doing it, which one you use depends on how you want to user your system. If you go to the main menu Settings page you’ll find a section called “Update channel”. Right now you’re probably on the “beta” channel which is the most stable. If you change that to the “experimental” (next most stable) or “canary” (least stable) channel then you’ll see other (and more frequent) updates. If you’d prefer a fresh “base version” install rather than an in-GUI update, you can download the appropriate installer from Releases · duplicati/duplicati · GitHub. You can use some of the steps in Downgrading / reverting to a lower version to manually download a newer version (say 2.0.3.5) and unzip it into your updates folder. Restart Duplicati and it should find that version and run it. I can confirm OneDrive v2 is in versions going as far back as 2.0.3.4 canary, but I can’t downgrade to 2.0.3.3 right now to check if it’s in there or not. If I use any docker image, there is no such option as OneDrive v2. In none of the Docker images from this year its possible to set OneDrive personal anymore. I could downgrade, but because on November 1th the support for OneDrive v1 will be gone, its not a solution. Is there something missing in the Docker-Images? I’m concerned about timing, due to Microsoft’s deadline, and this feature only being in canary release so far. Possibly migration aids and/or publicity is advisable in order to reduce broken backups come November 1st. Doing another Beta has been a desire, but I’m not sure when it will happen or if an Experimental would help. Now back to the actual latest question , I don’t run Docker but I’m wondering if psywolf85 runs CLI or web. is one way to see if at least that code knows onedrivev2. Also check web About --> System info version info, consider possibility of browser needing a page refresh, cache clear, restart, or whatever (maybe view is old). Hi, I am facing the same issue as psywolf85 with the official Docker images. This issue has been reported to Github previously. See duplicati.commandline.exe help <topic> for more information. were all missing. How does this compare to your lists? Are you missing more? Less (got Microsoft OneDrive)? Feedback from @discrucio and others with storage types missing in official Docker would aid understanding. Don’t look for it in 2.0.3.3, and ideally see how the new Release: 2.0.4.1 (experimental) 2018-11-08 does on a test system (because I’m not certain what database formats changed when, and downgrading can be difficult). Note that 2.0.4.1 experimental in both the official AND linuxserver Docker containers appears to have the complete list (so DO include the above 4 Microsoft items). I’m starting with a new one: duplicati/duplicati:linux-amd64-2.0.4.1_experimental_2018-11-08 without attempting any updates to an existing container, if that’s what you’re doing. I also tried a new 2.0.3.4. ??? Does that mean these are two different containers? I consider the one listed at top as “official Duplicati”. Regardless, you’re seeing this oddity at least sometimes, and the unpredictability of results does bother me. My guess is there was a mistake with the automated build script for the Docker containers that has been resolved as of 2.0.4.1 experimental. Yes - though there was a typo in my post. I meant to say the official (https://hub.docker.com/r/duplicati/duplicati/) and linuxserver (https://hub.docker.com/r/linuxserver/duplicati/) Docker containers. I make a distinction between the two because they use different mount points in their configurations. That being said - during my 2.0.4.1 -> 2.0.3.14 downgrade test I found that after re-upgrading to to 2.0.4.1 I’m back to missing the 4 items listed previously (even though I did see them before) so this DOES SUPPORT your finding of seeing this oddity “sometimes”. I tried 3 restarts of the official container and they have not yet returned. I tested 2 restarts of the linuxserver container and they all showed up correctly every time. When missing, they are also missing from the “Direct restore from backup files…” list. @kenkendk or @Pectojin, can you think of any reason why some destination option would load sometimes but not others? I checked the DLLs in both official and linuxserver update and they seem to be the same. I somehow missed this post completely. For the record, I upload images to https://hub.docker.com/r/duplicati/duplicati/, and I have no control over the linuxserver repo. 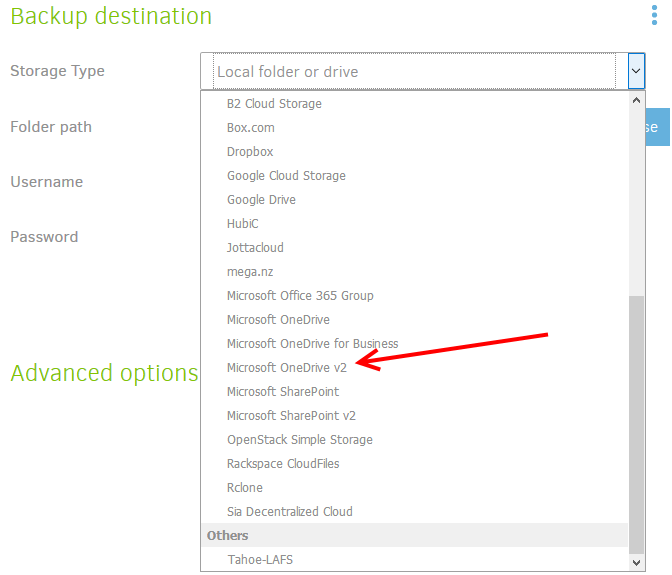 The onedrive and onedrivev2 backends are stored in the same dll Duplicati.Library.Backend.OneDrive.dll, so it is strange that one of the providers are missing. Failed to load assembly /opt/duplicati/Duplicati.Library.OAuthHelper.dll, error message: Exception of type 'System.Reflection.ReflectionTypeLoadException' was thrown. => Exception of type 'System.Reflection.ReflectionTypeLoadException' was thrown. Failed to load assembly /opt/duplicati/Microsoft.SharePoint.Client.Runtime.dll, error message: Exception of type 'System.Reflection.ReflectionTypeLoadException' was thrown. => Exception of type 'System.Reflection.ReflectionTypeLoadException' was thrown. Failed to load assembly /opt/duplicati/AWSSDK.Core.dll, error message: Exception of type 'System.Reflection.ReflectionTypeLoadException' was thrown. => Exception of type 'System.Reflection.ReflectionTypeLoadException' was thrown. Failed to load assembly /opt/duplicati/Duplicati.Library.Backend.OneDrive.dll, error message: Exception of type 'System.Reflection.ReflectionTypeLoadException' was thrown. => Exception of type 'System.Reflection.ReflectionTypeLoadException' was thrown. Failed to load assembly /opt/duplicati/MegaApiClient.dll, error message: Exception of type 'System.Reflection.ReflectionTypeLoadException' was thrown. => Exception of type 'System.Reflection.ReflectionTypeLoadException' was thrown. Failed to load assembly /opt/duplicati/Microsoft.SharePoint.Client.dll, error message: Exception of type 'System.Reflection.ReflectionTypeLoadException' was thrown. => Exception of type 'System.Reflection.ReflectionTypeLoadException' was thrown. Then restart the container and all should work. I will update the docker scripts and build a new experimental. I have now put up the 2.0.4.2 experimental build, which is the same as 2.0.4.1, except with extra dependencies installed in the Docker containers. I ran the fix (there’s a space-for-dash typo in “libmono-system-net-http webrequest4.0-cil”) and it worked fine. Also tried new container with duplicati/duplicati:linux-amd64-2.0.4.2_experimental_2018-11-12 however @JonMikelV in Release: 2.0.4.2 (experimental) 2018-11-12 raises a good question about upgrade. My testing used the kenkendk CommandLine “test” test, my BackendTool “help” test (27 keys), and a browser, which shows 29 entries in the dropdown, because keys for openstack and s3 are also in “Standard protocols”. Sorry for not clarifying that I’m running on W10 native - no Docker there. Ok, from the release post, I assumed you were running some Docker stuff. But good question about the updates. The packages that I added were a part of the “host” operating system packages. The Duplicati updater does not touch the system in runs on. Generally, when using Docker, I guess it makes sense to always update the container instead of using the built-in updater? HELP?! Trying to use Duplicati, but something's always broken! That makes sense but then wouldn’t we need to have 4 containers available - one for each of the release paths? Yup, most people will probably not even have the updates folder persisted, so a container restart would revert to the image version.